They don't have to be solid green but they need to be firm. You wouldn't want to fry them up when they were dark green and hard as a brick and at the same time you wouldn't want a tomato that was too ripe as it would fall apart. I like a nice heavy cast iron skillet. I then heat up some canola oil nice and hot. Egg wash, then the flour and finish with the corn meal. Mmmm the best thang to come form the south..Green fried tomatoes. Break up tomatoes if needed and add to celery and onions with half the bread/croûtons and the remaining ingredients. Pour into a 1 1/2 quart casserole. Top with remaining toasted bread/croûtons. Bake at 350 degrees for 50 minutes. Serves 8. Wash and drain cherry tomatoes; remove stems. Melt margarine (not diet margarine) in skillet. 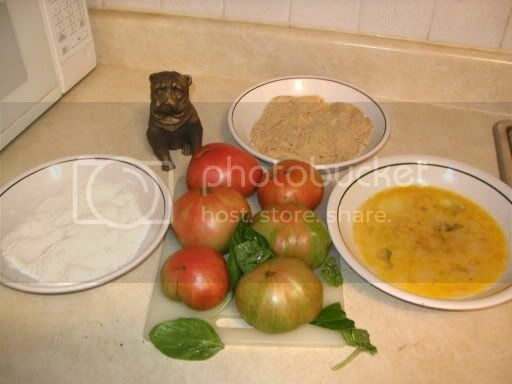 Add tomatoes, 6 Tbls brown sugar or honey and salt. Cook very slowly until liquid evaporates. Be careful not to let tomatoes stick or scorch. Put mixture in baking dish. Top with buttered bread crumbs and remaining brown sugar or honey. Bake in preheated 350-degree oven until crumbs are browned. Time depends on your oven and whether you are using brown sugar or honey; probably about 20 minutes. Cut tomatoes in half crosswise; put cut side up on baking sheet. Sprinkle with onion, peppers, salt and cayenne. Put a piece of butter on each piece, using 2 tablespoons in all. Put 1/2 c water in the pan and bake at 425° till tender. Melt remaining butter and brown flour in it. Add milk and the liquor from the pan and stir until boiling; cook 3 minutes more. Dish tomatoes on toast squares, pouring the sauce around them. Saute onion until tender. Add tomatoes, basil, sugar, salt and pepper. Cover; simmer 20 minutes. Add zucchini and continue to cook until tender, about 15 minutes. Combine eggs and cheese. Drop by tablespoonfuls onto tomatoes. Cover; simmer until dumplings are firm, about 5 minutes. Sift together flour, baking powder and salt. Add beaten egg; mix well. Slice tomatoes rather thickly and sprinkle with salt and pepper; drain. skillet until brown on both sides. Good for breakfast or lunch, served with bacon. Preheat oven to 350°. Grease a 1 1/2 quart casserole. Combine all ingredients; transfer to casserole. Bake until vegetables are tender, about 35 - 45 minutes. Place bread in food processor with garlic and 3 Tbls parsley. Pulse machine on and off to achieve coarse crumbs. Remove to a bowl; season with thyme, salt and pepper. Scoop out tomato pulp and chop; combine with crumbs and 2 Tbls oil. Spoon mixture into tomato halves. Place on baking sheet and drizzle with remaining oil. Bake in 350 oven for 20 minutes. Before serving, broil tomatoes until just golden brown, about 30 seconds. Sprinkle with remaining parsley. Serve immediately. Heat oil in a skillet over moderate heat. Add garlic and tomatoes and saute just until tomatoes are warmed through, about 3 minutes. Add pecans, vinegar, salt, and pepper and stir for 1 minute. Garnish with chopped basil. Serves 4 to 6. Rub a sheet pan with 1 tsp olive oil. Place tomato slices on pan and drizzle with 1 tsp olive oil. Combine bread crumbs, Parmesan cheese, onion powder, garlic powder and salt and pepper to taste. Place a thick layer of mixture on top of each tomato and drizzle with remaining olive oil. Bake at 425°F for 20 minutes until golden brown. Grease a flat baking dish. Slice tomatoes in thick slices, season with salt and pepper and lay in dish. Slice onion very thinly and place on each tomato slice. Cover with cheese and potato chips. Bake for 20-30 minutes at 350°F. shredded Cheddar cheese; cover mixture, and let stand 5 minutes. Preheat broiler. Arrange tomato slices in a single layer on a cookie sheet. Drizzle oil over slices. Sprinkle tomatoes with garlic, onion and herbs. Season with salt and pepper. Place cheese atop tomatoes and broil until golden brown and bubbling. Transfer to plate and serve.